Slate is made of highly compressed clay and volcanic ash that has settled for millions of years. The foliation allows it to be cut into thin sheets of rock, perfect for housing and other outdoor uses. 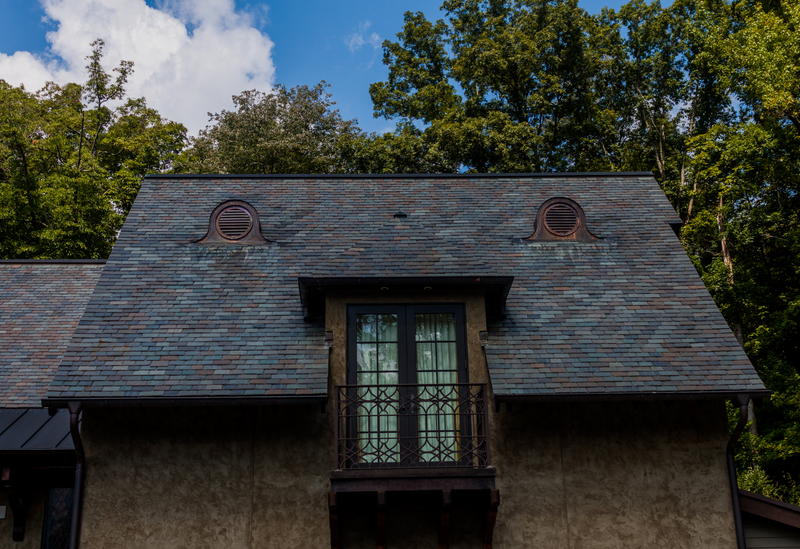 There are several reasons of why slate is a great option for roofing but we are going to list the four we find most important. It’s rock- simple as that. Given its high density, slate may outlive the house under it. Unlike metals or shingles, it could safely be returned to the environment or recycled for other outdoor or indoor uses. 2) Fireproof and climate resistant. Being that its made of volcanic ash, it would take the belly of a mountain to heat slate to a damaging degree. Consider it like the diamond of roofing materials, it’s hard and valuable when cut and placed properly. When installed properly, slate is a great option for any climate. 3) Helps lower net energy costs by improving temperature stability of the building. It’s high density resists temperature fluctuations and offers similar temperature regulation to that of a cliff or cave. Rock takes a long time to heat and only the exposed side will heat dramatically. This density barrier acts like a natural insulator, thus its popularity in western states. 4) It’s low maintenance and long lasting. Again, it’s rock. Slate is a great option for a house that is in harsher conditions. Occasionally, pieces can break due to irregularities in the foliation grain or a heavy branch falling on the house. If installed by professionals, a single piece of slate is easy to replace yourself, though not recommended.